Banana bread seems to be one of those things where everyone has their own recipe. This recipe is one that I got by combining a variety of recipes I found online. I knew I had about 4 cups of bananas, so I started at that point. While nothing's wrong with banana bread varieties, I wanted something where bananas starred, center stage. As always, something quick and easy is desired. The aroma of this banana bread wafting through the apartment made me want to eat some right then, and I almost burned myself eating a slice before it had cooled enough. A nice crisp crust formed around the moist and dense insides. It was delicious! I didn't even realize that I didn't add any other flavors (like cinnamon, nutmeg, vanilla, etc.) to the bread until I started typing the recipe. 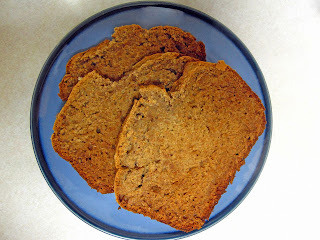 This banana bread is uncompromised banana flavor! And since it's a quick bread, it doesn't take long to make either! What's your favorite banana bread recipe? A crisp crust surrounds this moist banana bread with uncompromised banana flavor. Add eggs and bananas, mixing well. Mix in flour, baking soda, and salt until homogeneous.